ST. LOUIS – People attending Saturday night’s St. Louis Symphony performance ended up with more on their evening agenda than what was listed in the official program. A group of protesters sang for the audience an old labor organizing and civil rights song adapted in dedication to the slain Ferguson teenager, Michael Brown. 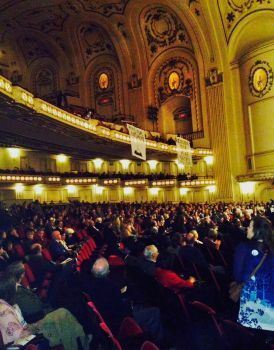 According to the St. Louis Dispatch, as the musicians and chorus were about to begin playing Johannes Brahms’ “Requiem” following the intermission, some audience members, all of whom held paid tickets, stood up and began singing “Which Side Are You On?” to a surprised crowd (story continues after video). Others scattered throughout the hall began standing up and joined in the singing while a banner that read “Requiem for Michael Brown 1996 – 2014” was unfurled from one of the balconies. The interruption was met with applause from some members of the audience and even from some of the orchestra musicians. AP reported that the St. Louis police received no calls or or complaints about the protest.